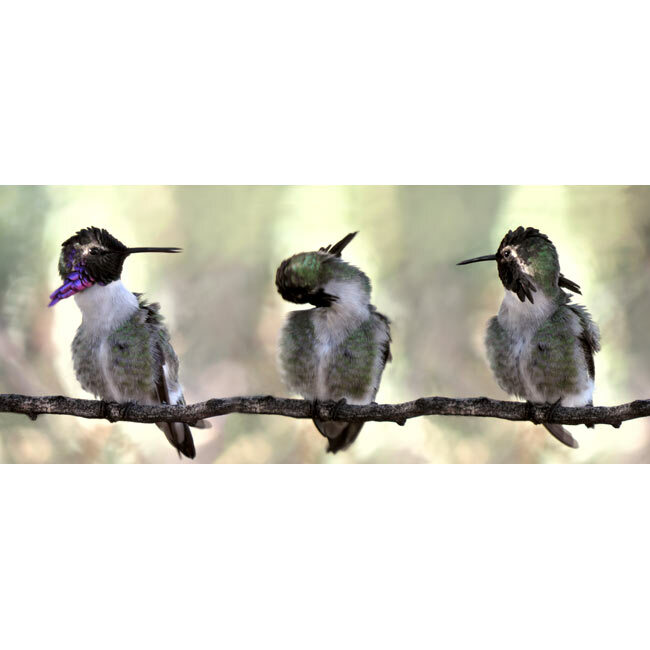 Costa Hummingbird showcases his body positions during preening in elegant lighting. Any Photo Progression shows you more than just a single image can. Comes in a variety of unique sizes; widths listed below for “standard” heights. Unique piece of beautiful photography art to have in your home or office. 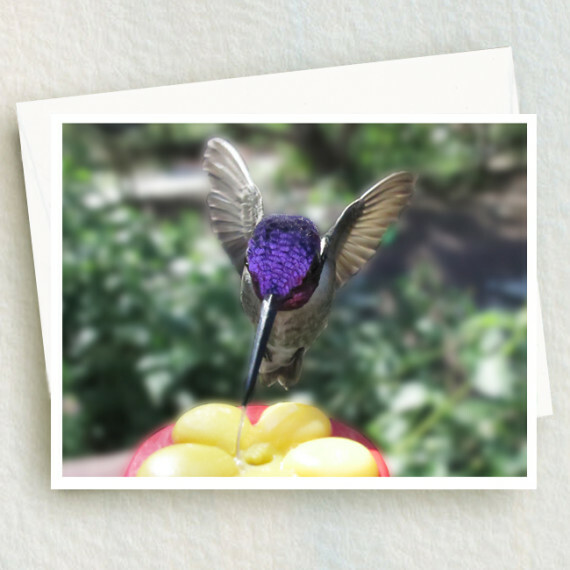 Get to know this beautiful Costa hummingbird as he preens. The lighting is particularly elegant for his body positions, colors and groget feathers, which the PhotoProgression showcases much more than one single image could ever do! Each progression is a unique piece of art. Sizes are “standard” based upon the height of the image. The width varies by progression and is listed below for the heights of 2.5” to 5.5”in one inch increments. This piece is not as wide as some others. Therefore it makes a good choice for a taller progression to see more of the detail. This Progression’s variety of sizes are: Small – 2.5″ tall by ~6″ wide, Medium – 3.5″ tall by 8″ wide, Large – 4.5″ tall by 10.5″, and Extra Large – 5.5″ tall by ~13″ wide. Other custom sizes are available directly from us upon request, such as 15″ x 6.5″; a recommended size to enjoy all the details for this piece. Call or email us for information. Choose high quality Glossy or Satin paper. The Satin paper has lovely colors and less glare which is nice in the larger sizes. The four print sizes can fit many places in your home or office. Where will you enjoy this beauty? Borderless – The print is all image – no border. 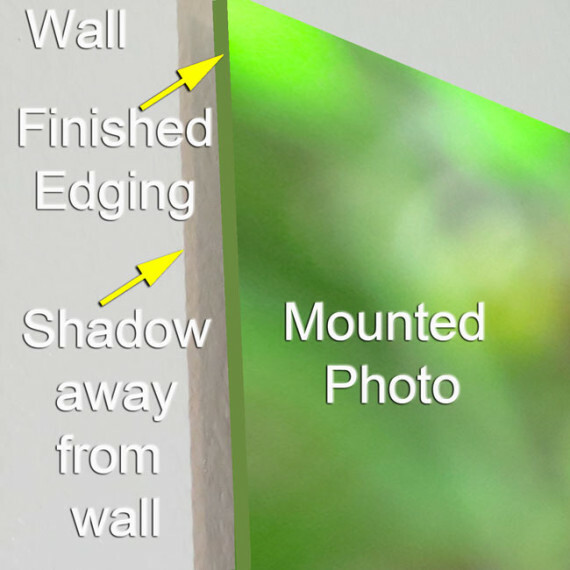 Mounted Borderless – Your print is mounted on gatorboard with the edges finished with a color complementary to the image. 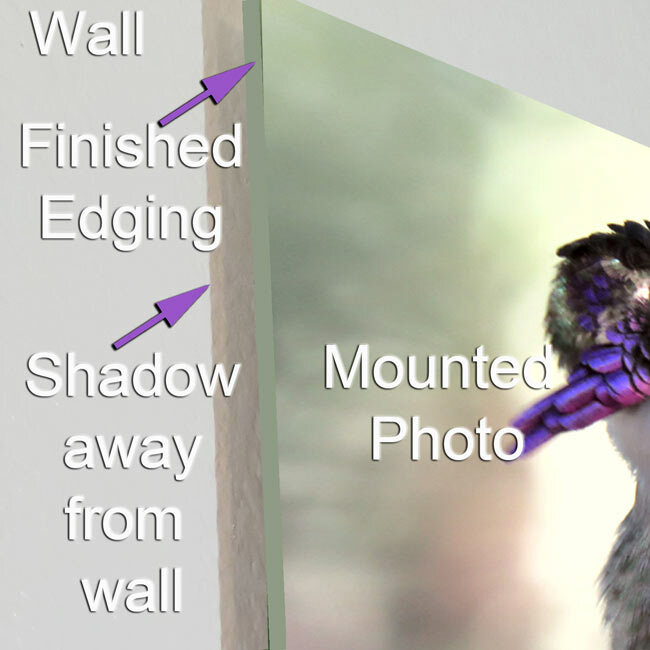 Hardware makes the image “float” way from the wall. See example above. 1″ White Border – around the photograph makes it suitable for traditional framing. For information regarding our shipping prices and our aim toward 100% satisfaction with our products, please read our terms & condition page. Note: Website Launch Celebration: Free Shipping in the U.S.! Let this brilliant male Anna find a special place in your home or give him as a gift. He is an image of beauty to be enjoyed. Unique and beautiful image, Broad-billed hummingbird at the bath. This trusting Costa comes up to the small handheld feeder while I hold my camera in the other hand! Great experience for both of us. 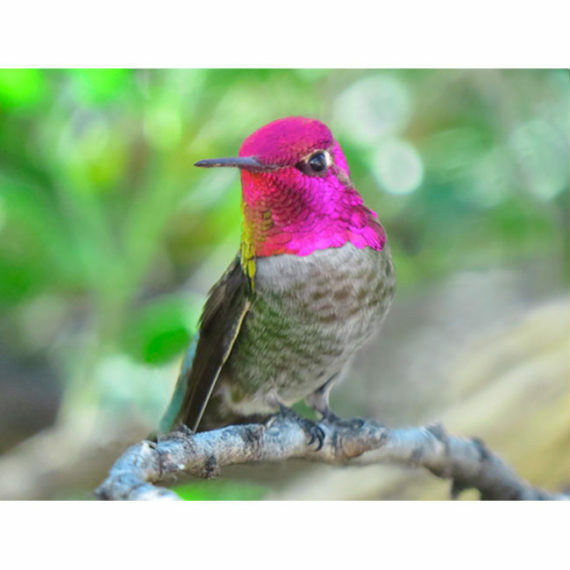 This Costa Hummingbird leans back for a moment while preening. 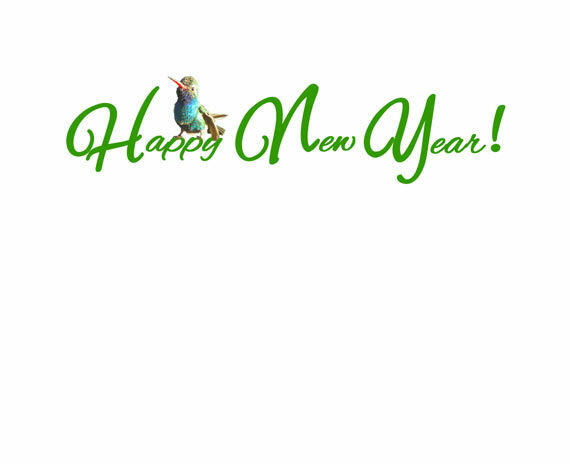 A high gloss, all occasion 5.5″ x 4.25″ card. Keep scrolling way down for more information. Happiness Moments - Featured Collection	Free! 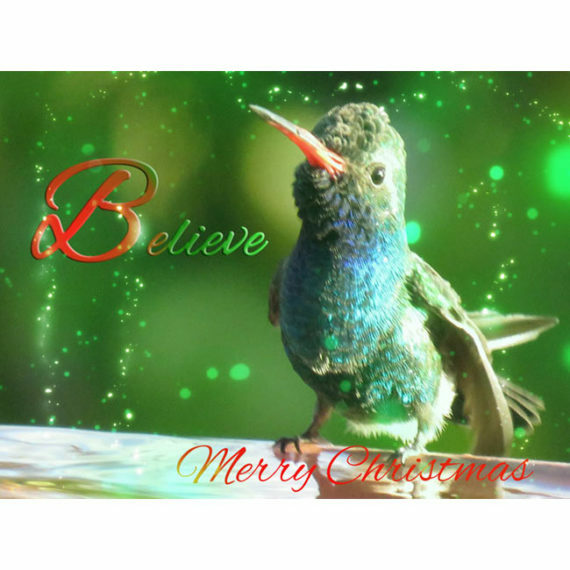 Hummingbirds and flowers are the emphasis of this website, providing you with products that will bring my magical images into your life or into the lives of your friends. Hummingbirds can bring magic into your life. Flowers can make you smile. Other beautiful things and places are included. So explore to your hearts content!